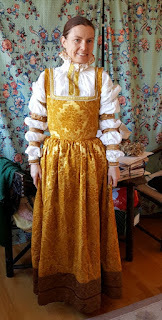 Eva's historical costuming blog: Re-making. I had hoped that it would be enough to take in the bodice of this gown only in the sides, and not have to unpick the gold trim and all the fake pearls around the neck, but unfortunately not. I tried, and I tried, but in the end I had to cut off the straps in front and move them closer to the middle. Yesterday I sewed the skirt to the bodice by hand at Gotvik's sewing meeting, which I hold bi-weekly at my place. The sleeve bands are too wide over the biceps too, but I'm not sure if I want to take them in permanently yet, since I have started going to the the gym every second day. 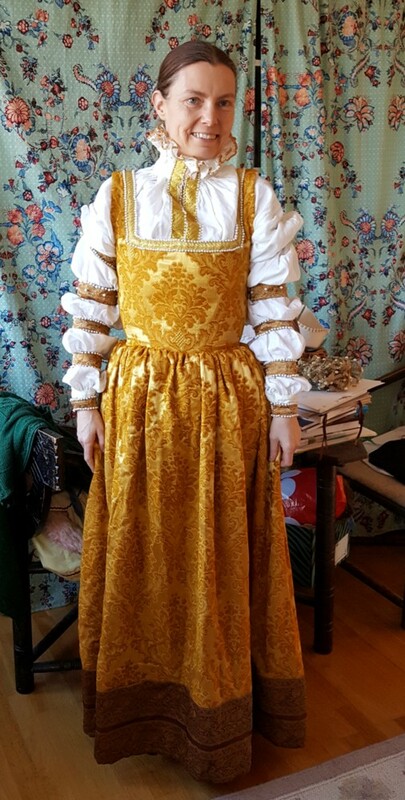 This is how it should be worn: with a loose gown over the kirtle and with some kind of headwear. The page where I discuss the outfit more in detail.